2012 was a pretty good year for my collection. For the most part, I remained focused and knocked off almost all of my 2012 goals. Here are some highlights from the year in no particular order. Derek Jeter is a pretty common signature. Steiner really cranked out Jeters this year and it seems as though the price is softening. 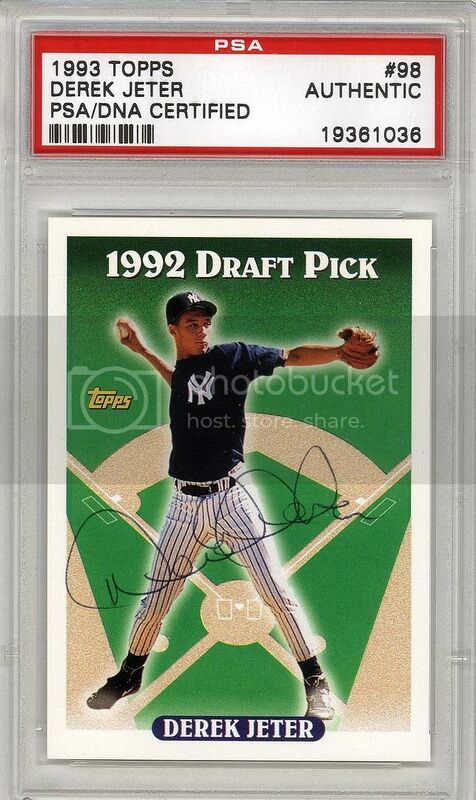 Steiner had a few sales where Jeter autographs were below $200... something we've never seen in the past from them. 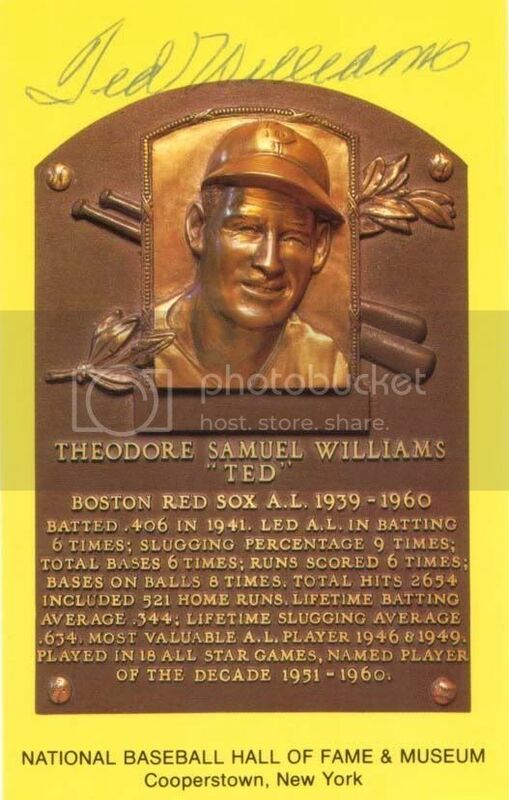 For common signatures I try to get a good inscription, or as in the case of this signed card, a rookie style signature. No matter how many more Jeter signs, he won't be signing in this style ever again. This could be my bargain of the year. I found this on a table at a flea market mixed in with a bunch of signed photos from common through-the-mail signers. Not bad for $30. 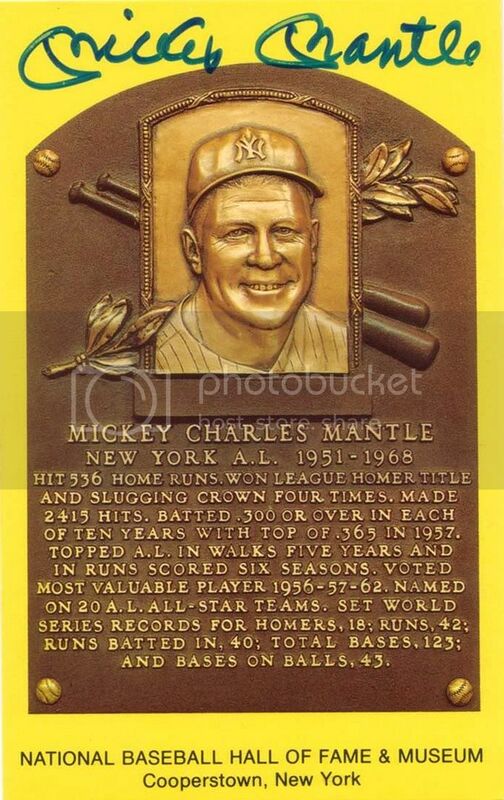 For as common as Mickey Mantle is, there are not a tremendous amount of signed Hall of Fame Postcards. Probably because he was never much of a mail signer. 1924 NY Yankee payroll check signed by Hall-of-Famer Ed Barrow and 2013 HOF inductee Jacob Ruppert. Endorsed by outfielder Lawton "Whitey" Witt. Mercury and Gemini astronaut Virgil "Gus" Grissom. Really fresh, choice signature. 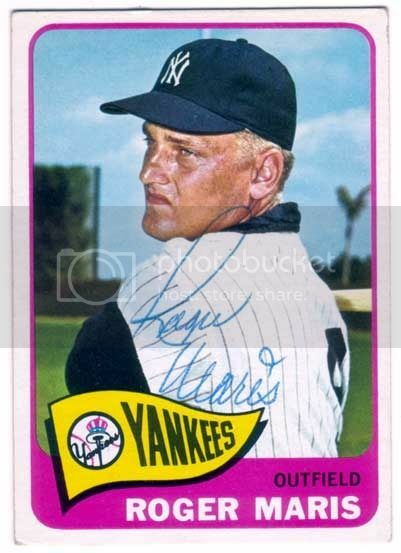 Roger Maris signed 1965 Topps card with a great ballpoint signature. Perhaps my favorite of the year. 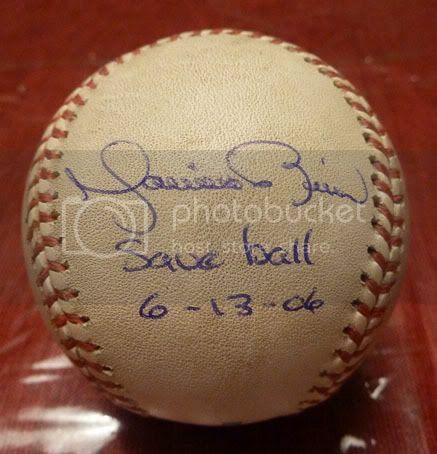 On June 13, 2006, this ball was used to strike out Cleveland Indians second baseman Ronnie Belliard, winning the game for the Yankees and giving Mariano Rivera his 392nd career save. I haven't been as focused on comics in the past year, but I did add a few ECs to my collection. 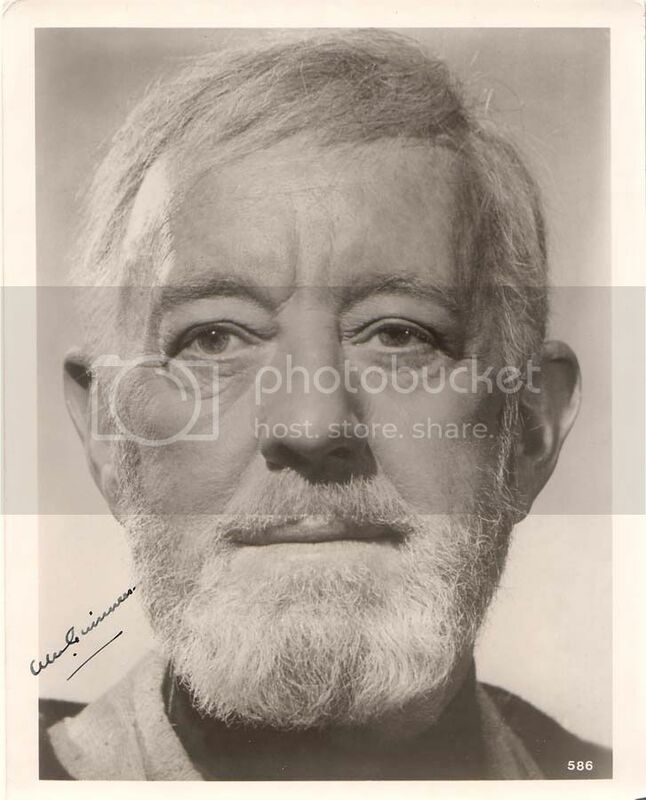 And finally, I was happy to add an Ian McDiarmid to my Star Wars collection. Best wishes for happy collecting in 2013! "Apollo 1", "Mariano Rivera", "Mickey Mantle", "autographs", "comic books"
"Comic Book Collecting Association", "comic books"
CBCA Amateur Art Contest! Cash + Fun! The Comic Book Collecting Association (CBCA) is pleased to announce the first annual CBCA Amateur Art Competition. The competition allows amateur artists to showcase their finest work, with the winning submissions determined by voting on the CBCA Message Board. A $100 grand prize will be awarded to the winner with $25 awards to the runner ups. Entries will be accepted now though May 15. Entries will be posted online for voting beginning May 19. The format and length of the voting is contingent upon the number of entries received, and will be announced at the commencement of voting on May 19. CBCA Directors and Officers may enter the competition, however they are not eligible for the cash award. If a CBCA Director or Officer is a finalist, the cash award will go to the entrant with the next highest amount of votes. The CBCA reserves the right to deny eligibility to any participant at their discretion. Anyone who registers at the CBCA forum may vote. CBCA membership is not required for voting. Submissions must be an original piece of artwork. There are no limitations on the type of format – entries may be a single character, group, splash style page, a paneled page, pinup style pose, strip art, color, black and white… whatever format you think best showcases your work. Reproductions of artwork originally created by other persons are not permitted. For example, an illustration that is an homage to the cover of Fantastic Four #1 is acceptable, however a nearly identical reproduction of the cover of Fantastic Four #1 is not. Submissions should be tasteful and suitable for all ages. The CBCA reserves the right to deny any submission at their discretion. Because submissions will be posted anonymously, be sure your signature is not an integral part of the artwork – it will be digitally obscured. Submissions should be sent as a .jpg, .png or .gif file to art@comiccollecting.org no later than May 15, 2010. Be sure to include your name, address and phone number with your submission. Please send in a size large enough to showcase the detail of your work, but very large images may be resized by the CBCA to an appropriate screen size. Contact the CBCA at info@comiccollecting.org or visit the forum here. I just found this new feature on Google Docs that allows you to embed a document. With that, I'd like to post some recent editions of the Comic Book Quarterly, the newsletter of the Comic Book Collecting Association. Here is the Winter 2010 edition and a direct link to the newsletter. The CBCA is for comic book collectors and dealers with a common goal: promote fellowship, education and ethics within the comic book collecting community. Our success is contingent on the interest and participation of a membership in agreement with these goals and the Association’s common-sense Code of Ethics. The CBCA is for new collectors looking for opportunities to network and learn, as well as more seasoned collectors looking to assist with member events and help shape the direction of the hobby. In any case, CBCA membership should be fun and rewarding! We are also incredibly excited to announce the official formation of a Board of Advisors, which features some of the most well known names within and around our community. From prominent dealers to industry executives to comic pros, the Board of Advisors is composed of individuals who have expressed a desire to associate and assist with our new effort, and provide valuable guidance as to how the CBCA can best serve the community. Vincent Zurzolo, Metropolis Collectibles, Inc.
We are also very pleased to welcome the “first” new CBCA member: George Pantela of GPAnalysis.com. We envision a very strong partnership in the coming days and truly look forward to having George work with us to support our Mission. As a bit of background, the CBCA has evolved from the former Network of Disclosure. Last December, the group’s members approved by ballot the formation of the new group, mission and code of ethics. The notion of disclosure, transparency and ethical practices are at the core of CBCA, but overall, CBCA is a more rounded organization. Ideally, the CBCA’s expanded focus will be more inviting to collectors and dealers alike. We hope that you take a look at the CBCA and consider joining. 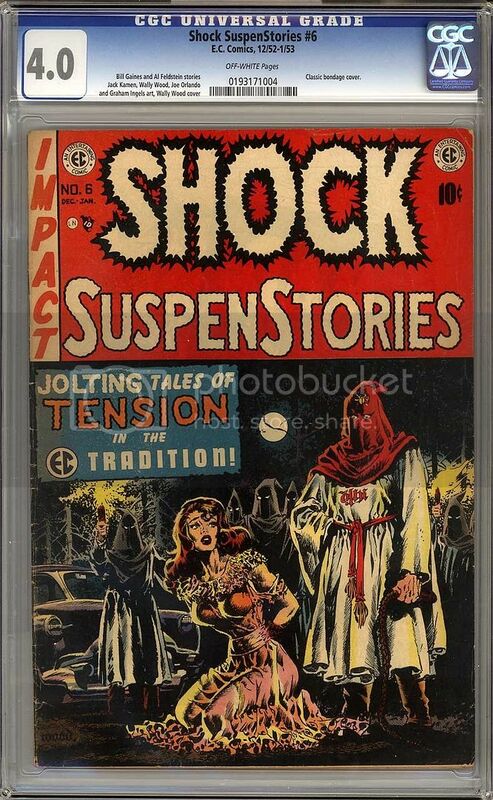 Noted comic book collector Jon Berk has granted the Network of Disclosure (NOD) the rights to reprint his wonderful essays and articles on the Golden Age of Comics. A fantastic mix of information, nostalgia and fanboy joy, this is required reading for any serious comic book collector. In a time when it seems like more collectors are concerned with latest sales figures, CGC census data and backslapping over nosebleed prices paid, it's refreshing to take a step back and learn about the humble beginnings of the art form. "John Berk", "Network of Disclosure", "comic books"
Collectors have a tendency to focus so much on the acquisition, that sometimes they forget to actually enjoy the item once it lands in their collection. Looking through my hobby room recently, I found small piles of stuff I forgot I had purchased! You know how it goes... the package comes in the door, you open it after dinner, you set it aside to look at it again later... and before you know it, "later" is 2 years. So, I'm trying to dedicate myself to focusing on enjoying what I collect more than falling into the trap of being a collecting automaton mindlessly checking things off a want list. Here's a book I pulled from a pile. What a fun read! Avengers #52, May 1968. 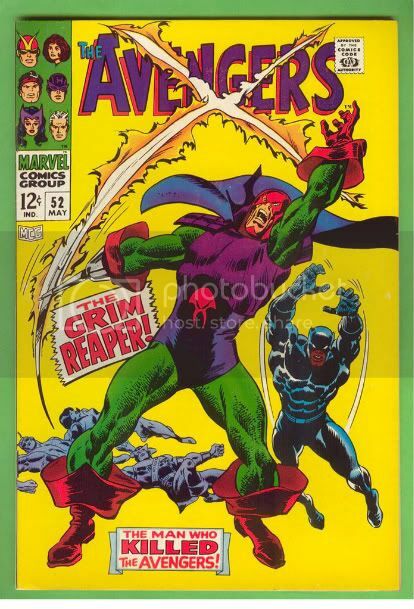 What makes this story so special is that I first encountered it as a reprint in the Avengers Marvel Treasury Edition #7 (1974), which I still have the tattered original that bears my 6 year old signature across the cover. Just because I took a long hiatus in posting to the blog, doesn't mean I wasn't collecting. So, I have some nice acquisitions from the past year to share. 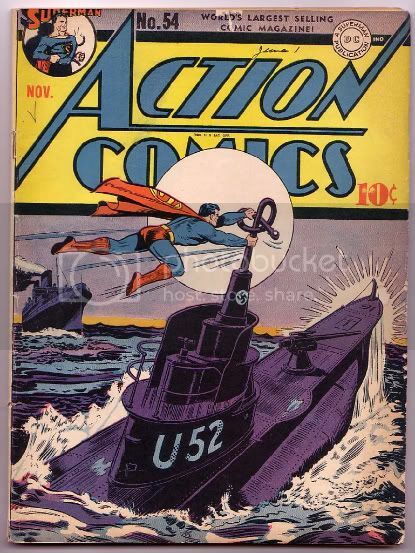 I'll start with this copy of Action Comics 54 I picked up earlier in 2009. 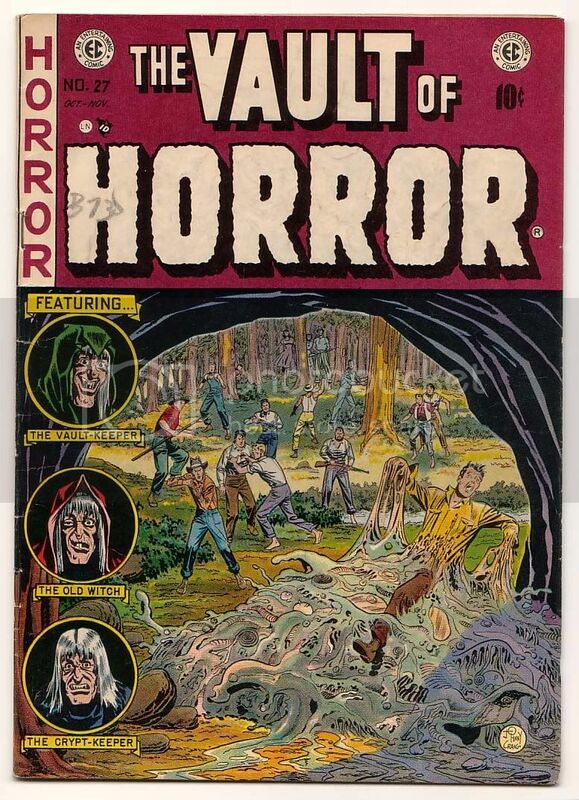 I love the Action war covers, but they are getting harder and harder to acquire... seems like a lot of collectors have decided to focus on them. The competition now makes me wish I had worked a little harder at collecting them when I started years ago.